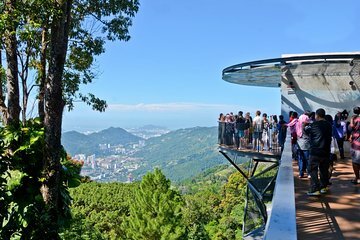 Een smeltkroes van culturen en keukens, Penang is een must-visit onderdeel van Maleisië. Als je maar een korte tijd in Kuala Lumpur verblijft, is deze privédagtocht naar Penang een goede manier om je te oriënteren. Luister naar het lokale leven in een van de vele vissersdorpen van het eiland, leer meer over de Chinese, Birmese en Thaise geschiedenis en ervaar een aantal typische Penangite-kunsten zoals het maken van tinnen. The worst experience ever. The driver did not arrive on time, so I called Harry in operations who was very rude and seemed like he was sleeping. He said he would call me back and never returned my call. I called 5 times and he did not answer. The driver eventually turned up and said he was not given my number so couldnt tell me he was stuck in traffic. The tour was not planned at all and we were asked where we should eat how would we know, it is our first time in Penang. The tour guide was confused what he was supposed to show us and everywhere we went we were told yes this is it.... The beach was lovely, we ended telling the driver to leave us for a bit to enjoy it ourselves. We ended up buying KFC. Very bad company and very unprofessional. We booked this tour the night before and the customer service was extremely helpful. Our driver picked us up promptly from our hotel and we made our way to Penang from KL, he was very knowledgeable and made our 4 hour trip very interesting. Upon reaching Penang we picked up our tour guide who was very informative. We visited Kek Lok Si and the Snake Temple which were both very impressive. Lunch was amazing too! Would highly recommend this tour.